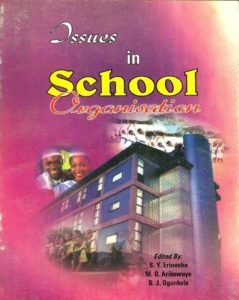 Issues in School Organisation, provides readers with a wealth of useful, stimulating and well-articulated reflections on issues which in multidimensional ways determine the effectiveness and efficiency of the school as a learning organisation. Many teachers and school heads lack adequate and sufficient up-to-date knowledge about succinct aspects of the school as an organisation. Therefore, this book has emerged out of a passionate concern about critical issues of pedagogical interests which cut across the management of the school as an organisation. All aspects of the school system discussed in the book would not only contribute to existing knowledge in educational theory and practice, but would enhance teaching and learning activities in our schools.